Configuring network topologies can be quite tedious when the number of brokers in the system is large. To help ease the configuration overhead for these types of situations, a broker can be configured to look up its broker connections using a LDAP v3 directory server. The basic feature was added to satisfy AMQ-358. There are known problems and limitations with this implementation. These deficiencies have been addressed in AMQ-1587. The features discussed on this page require the patch attached to JIRA issue AMQ-1587. This patch should apply cleanly to the ActiveMQ 5.0.0 release or the current development trunk. The following table lists a known subset of directory servers and their compliance to work with the LDAP discovery feature. Most LDAP v3 directory servers will support this feature if they properly implement the RFC2307 schemas. In order to support the persistent search capabilities the server must implement the extension defined in draft-ietf-ldapext-psearch-03.txt. LDAP v3 directory server which do not support RFC2307 by default. Support can be added by manually importing them. See vendor specific setup requirements on how to do this. 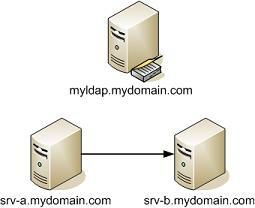 LDAP v3 directory servers which do not support the draft-ietf-ldapext-psearch-03.txt. uri null Yes The URI of the LDAP v3 Server to connect to (i.e. ldap://host:port, failover://(ldap://host1:port,ldap://host2:port). base null Yes The RDN base used as the root for the search criteria. user null Yes, if not using anonymousAuthentication The username needed to bind to the server. password null Yes, if not using anonymousAuthentication The password needed to bind to the server. anonymousAuthentication false Yes, if not using user/password Enable if you want to bind to the server anonymously. This is recommended over using user/password properties since your login credentials will not be stored in an unencrypted XML file. searchEventListener false No Enable if you want the broker to stay in sync with changes made to entries matching the search criteria. searchScope ONELEVEL_SCOPE No Can be any of search scopes defined by javax.naming.directory.SearchControls class. OBJECT_SCOPE - search the named object defined by base. ONELEVEL_SCOPE - search one level of the base. SUBTREE_SCOPE - search entire subtree rooted at the base. All of the properties defined in Networks of Brokers are also available to the ldapNetworkConnector. 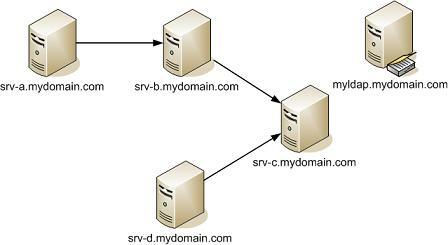 Any of the properties defined for a normal networkConnector will be used as connection parameters to any discovered brokers matching the search criteria.